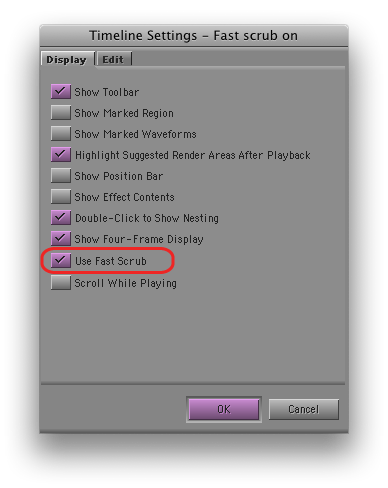 If you’re using Avid’s new DX hardware (Nitris or Mojo), then you’ve probably been using “Fast Scrub,” perhaps without knowing it. This is a slick new feature that makes the timeline more responsive, by dramatically improving the number of frames displayed as you drag. Fast Scrub offers some of the smoothest timeline performance in the business — so smooth that you can often check your work just by dragging through it. It also improves audio responsiveness, especially if you keep the caps lock key down. (I don’t, but I know many of you do.) If you’re using DX hardware you’ll find it in Timeline settings. It’s turned on by default. But if you like to leave waveforms on — and I can’t work any other way now — then Fast Scrub will make you crazy. Why? Because it causes waveforms to redraw much too frequently, even when you are just manipulating video. If you simply move a video clip in segment mode — with no change to any audio — all your waveforms, for your entire timeline, will slowly redraw, during which time you can’t do anything but wait. Many other seemingly innocuous things will also trigger a redraw. Undo will usually do it, for example. I’ve even seen redraws after simply changing a clip name in a bin. With a fast CPU, waveform display in the Media Composer has become very usable (and waveforms in MC have always been much more detailed than in FCP). But with Fast Scrub you have to turn waveforms off, or keep a straight jacket handy. Okay, so why not just disable Fast Scrub, itself? Timeline dragging is plenty responsive with software-only systems or even with Adrenaline, so turning it off shouldn’t be a big deal. Unfortunately, with the DX hardware and Fast Scrub off, timeline dragging goes back to the way it was before version 3 — very slow. So you’re damned either way. Caught between a rock and a hard place, I’ve had Fast Scrub off for a week or so now, and I’m getting used to it. But I sure wish the timeline could be as responsive as it is on my laptop at home. This entry was posted on October 26, 2009 at 6:40 am and is filed under Avid, Avid Technical Tips, Avid vs. Final Cut, Avid Wish List & Bugs. You can subscribe via RSS 2.0 feed to this post's comments. You can comment below, or link to this permanent URL from your own site. interesting that you find Avid’s waveforms more detailed than FCP. As someone who is constantly switching back and forth between both programs, I not only find FCPs waveforms to be more accurate but there is none of the constant redrawing of waveforms slowing you down like in Avid. Avid’s waveforms seem like a guide more than an actual, functional tool. I’ve always had redraw issues with the waveform display. It can slow things down dramatically in all sorts of scenarios. I keymap the display in the timeline settings allowing me to turn it on and off for tricky audio edits. If you don’t want to wait for all your clips’ waveforms to redraw just press CMD+. (CTRL+. on a PC) to cancel de redrawing. One big reason that I favor Avid’s waveforms is that they can be enlarged vertically without changing the size of the track itself. This means that you can always see the level of detail you need. And waveform magnification is memorized with a timeline view so you can get back to it quickly, if needed. But I agree — you have to map Sample Plot to a button so you can turn it on and off. Otherwise, it’s too slow. Final Cut wins the speed race because it caches waveform bitmaps — which means that enlarging them can’t add detail. Avid’s caching scheme is less efficient, but it might not take much to make it better. Bug fixes are critical, but just making the cache bigger would probably help a lot. It would be cool if you could turn waveform display on for only one track. That might speed up the redraw and it’s often all I need anyway. I completely agree with LaRue. I’ve got timeline settings so I can do minute track adjustments on pairs of tracks (A1-A2, A3-A4, etc. — it basically just enlarges those tracks and shrinks others). It would make great sense if I could tell the timeline to show waveforms just for those tracks as well.